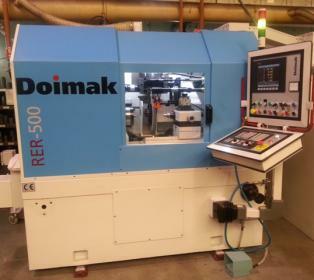 has recently invested in state-of-the-art equipment to expand its production capabilities. Among several new purchases, Heroslam has acquired a new CNC grinding machine for their circular and planetary die production department. The acquisition of this new machine comes in response to increased demand for large dimension and special circular and planetary dies from its leading customers in the aerospace, oil and gas, railway, nail and automotive industries. This new equipment can produce large circular dies up to a 420 mm diameter and 400 mm height and is able to produce special threads such as UNJ, Trapezoidal and Pipe threads. HEROSLAM has also acquired a new coating furnace in order to double the capacity of its surface treatment department. The need of coated dies for rolling hardened parts (10.9, 12.9, etc) and special alloys, along with the important cost savings that a longer tool service life provides, have significantly increased the demand of coated dies (GG coating, Nitrading, etc) from its customers and this new equipment is intended to cover such a demand. Finally, and in order to comply with its strict Quality Assurance Program, HEROSLAM has recently acquired a new digital profilometer in order to measure and verify the accuracy of the threaded profile of 100% of the dies that are produced at their facilities. With this new equipment, HEROSLAM intends to continue improving the quality of their thread rolling dies in terms of accuracy, quality consistency and service life as well as to meet the increasing demand for large dimension circular dies.